16-year-old Merelin Lindon’s father has been missing for 4 years. No one knows where he went, or why he left. But a mysterious coin may lead Merelin on a journey to find out what happened to her father, a college professor with a radical perspective on literary mythologies–and especially Tolkien’s Silmarillion. Merelin’s quest for answers takes her to a a strange world that has ties to mythology known mostly through books. Though homesick for her family, Merelin makes friends with a small group of people who are caught up in the middle of a war with a horrific race called the Ungulion. Rather than going back through a portal to her own world, Merelin joins in the battle to save a world that is more a part of her than she realizes. 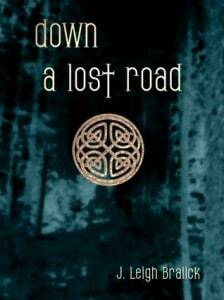 Down a Lost Road by J. Leigh Bralick is a lovely tribute to the writings of Tolkien, but rich in its own mythology and memorable characters. Merelin is everything I like in a heroine; she is strong, romantic, intelligent, and even at times soft and vulnerable. Yatol is a born leader, but has secrets that haunt him. Even the more minor characters like Kurtis, a colleague and former student of Merelin’s father, and Mr. Dansy, a shopkeeper with a colorful life story, are fascinating and full of life. Though I felt it started out a bit slow, Down a Lost Road certainly picked up after the first quarter of the book and held my attention. I thoroughly enjoyed Bralick’s writing style and the rich descriptions of the lands and the people who live in them. It’s also a bit light on the romance, but the fantasy aspects of it are solid and more than enough to keep readers interested. I’m so glad that the story doesn’t end with Down a Lost Road! I’m looking forward to reading more about Merelin, her father, Yatol, and everyone else that contributed to so many pleasurable hours of reading in the sequel, Subverter.